A year ago she started her private practice from nearly nothing. Now Kate Prouty sees anywhere from 15-30 clients each week. Her practice focuses on oncology massage therapy and massage for people with medically complex conditions. 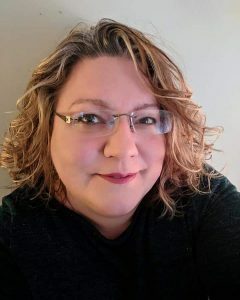 In this interview she shares some excellent marketing tips and other tools she used to build her practice, Patient Relaxation, LLC, in Lansing, Michigan. I met Kate in 2017, when she completed our 4-Day Oncology Massage Therapy foundational course. She followed it with our 40-CE hour online Oncology Massage Therapy Advanced Mentorship course, where we focused about half of our work on marketing. She completed that in December 2017. I was interested to hear how intensely she focused on practice-building, and what worked for her. Kate Prouty Built Her Massage Therapy Practice, Patient Relaxation, LLC, in 13 Months. Tracy: You’ve had a busy year! What does your practice look like now, compared to a year ago? Kate: I work full time. I see about 18 people/week average, sometimes 25 or 30. Minimum is 15. About half have complex medical conditions. About half those are people with cancer. I am on my way to seeing about 8 people per week with cancer or cancer histories. Thirteen months ago, in late 2017 when I finished the mentorship course, I was afraid. I was working at a spa. I wanted my own practice. I thought there was no way I can make this happen. I was starting from zero. In September 2017 I almost felt reckless when I signed up for your online mentorship program, literally the day before it started. However, it was the right decision. I threw it onto a credit card, closed my eyes and hit “purchase.” I knew that I needed a leg up in order to gain both confidence and credibility, so that I could establish a private practice (either my own or within a hospital or cancer center). I chose carefully, actually. Tracy: How did you grow it from 11 sometime clients to 390 people on your email list, and 15-30 sessions per week? Kate: There were a lot of steps. First was goal setting. I wrote down goals—stretch goals, and reasonable goals—in a little notebook. Personal goals relating to the business, like I want to be able to walk into my building and smile. I want to be able to sleep at night because I’m not panicked about money. Then I broke it down into steps. What do I need to do to get to this goal, for real? How much money do I actually need as a bare minimum, and how much each week? By getting really concrete, I realized as long as I was making as much as I had been making at the spa per week, I would be okay. Because I’d been okay, working at the spa. I got help from a number of places. The oncology massage mentorship course, of course! I’ll tell you about the networking in a bit. In the first month when I started, a woman came to me who was an amazing marketing specialist. She had a background marketing credit cards, and she offered a trade. 30% off sessions if we can do a marketing meeting for a half hour every week. I took it. The marketing specialist said, “I will give you an assignment every week. We did that for about 10 months. Every week. I followed her advice: Get a notebook, and fill out one page for each month, 12 in a row. As you go through every month, jot down EVERYthing you do for marketing purposes. Every single Facebook post, every article, every presentation. Keep track of the research you did or what you worked on. Did you make phone calls? Write every little bit down, then don’t think about it. Then go to the next month. But if you notice a sudden uptick in business, look back and see if you can correlate. Kate: The marketing specialist advised, “After a year, sit down on January 1st. Block off the whole day. Look over with colored markers and mark the ones that seemed to have the most impact and the ones that were a waste. Now you’ve created your framework for the next year.” She also told me not to dismiss the ones that didn’t seem to make a difference, it may take longer for those to come around. Then she told me write them in the NEW year’s notebook and you have half of your marketing plan. I look back at it and it’s pretty darn impressive! It’s clear which ones worked. Here is an example: in June I wrote down: Ran a senior citizen special, an ad for cancer survivors, and I taught a class on self-massage for people with cancer. I emailed an MLD specialist for some information. Fourth, I did a Groupon. I talked to Groupon and bargained. I told them, I’m just a little person. I work with people with cancer. It turned out I made more on a Groupon massage, even with the low percentage, than I had done at the spa. I was doing better than at the spa. Because Groupon is a wide net, I saw lots of different people. I got to practice setting up a practice. Also, I tapped into local referral groups. Angie’s List for my town. On Facebook I found “Not Your Mother’s Networking Group.” It is only in this area. It’s a curated group. You have to answer questions to get in. It’s got 17,000 women in it. They post everything. Anything from, “Does anyone know a plumber?” to “My kid has these red patches on their back. What is it?” It has been a source of lots of new clients. At least 50 people came from there. Tracy: Tell me about your networking. One person I told this to was an oncologist. Sometime later, when I returned to the hospital to ask if we could bring in OMT in that part of the hospital the oncologist recognized me. “Aren’t you that person…?” I was! 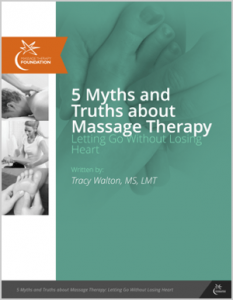 In the oncology massage advanced mentorship program, it helped that we had to CREATE the marketing materials, not just do the research. We had to actually create letters. And documents. And the website. (I have had so many compliments on my website!) Writing the emails to talk to oncology social workers. Wow, did that help. That’s how I found people! I talked to nurse navigators, but Oncology social workers were the ones who knew where things were, they knew everyone I should talk to. Tracy: How did those meetings go? Kate: At the end of every single contact I made, I asked, “Who else should I be talking to?” People love to be asked for advice. Ask them who else I should be talking to. Who are the leading practitioners? Who are the leading referrers? If you ask that question frequently enough the same names will pop up and you see who is making the world go around. There might be oncology social workers at one hospital who aren’t nearly as influential as the ones at another hospital. In your course, I had to collect all that contact info and run it by you. Pretty soon I had a whole bunch of contact info that was redundant. I realized, “AHA.” This person is THE person. Then I spoke to her and asked her who else I should talk to? She said, “This other person, but let me call her first.” So then I got an introduction. Tracy: Let’s talk about your radical fee increases. You started low, then moved your fees up quickly over the year. Kate: Remember, I was starting from nothing. I needed to make what I had made at the spa. That was low. At the beginning, my weeks were pretty empty. I would post on “Not Your Mother’s Networking Group.” I would offer $30 massage that week. I did 30 massages that week. The next week, all $40 massage. Then I did $49. In the beginning, I told every client, “It’s a new practice. Can you please go back into the “Not Your Mother’s…” FB group and write that you liked it, so people trust me? Before the end of that week I had 20 recommendations. Every time I would fill up the week, I’d say, “I’m full Thursday but there are six openings on Saturday. Which bumped up the post, my clients saw it, they would comment, “Kate is awesome.” That momentum would barrel me into the next week. Sunday night, a post again, when people are looking, filled up with more. All of this in the first few weeks. I offered $49 massage for a couple of weeks. My marketing friend said that was a distinct breaking point. She said “You can’t keep going at $49 because you train people that your work is too cheap.” One goal was more emails for my list. I had wanted 100 people on my list in 8 weeks. Well, I was there. I got it. Tracy: How did you break the $49 barrier? Kate: So then I bumped up a bit. I sold packages at $150 for 3. Lots of the $49 people bought 3. Then I had 200 people on my list. Then they were referring people to me. But I had to get a critical mass up. 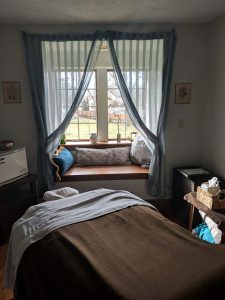 Kate Prouty’s Massage Therapy Space in Lansing, Michigan. My fee at end of 2018 was $80, but not everyone was paying that. I was still running a lot of specials, or leftover packages at the lower rates. At the New Year, 2019, I moved into a more affluent area. I brought my fees up to $95. BUT, I gave all of my existing clients either 1 or 4 massages at last year’s $80 rate. If they had one massage last year, they get one in 2019 at the old rate. If they had 4 or more last year, they can get 4 at the old rate. Tracy: Your private practice sounds like a real partnership between you and your clients! In Part 2 of this interview, to post next week, Kate will answer more questions, starting with her partnerships with hospitals, a work in progress. She will talk about her study of hospital-based massage therapy at the Mayo Clinic. She’ll share some more outreach tips. Finally, she will offer advice to other MTs and OMTs about practice-building. See Kate’s business Facebook page, Patient Relaxation LLC, here. In hospital-based massage, where budget constraints have to be considered, the answers to these questions can be used to figure out how best to allocate massage services across the hospital. How can massage therapy help the highest number of patients, and have the greatest impact hospital-wide? Most of the time, research on massage dosing is not available, so practitioners do their best with clinical observations. At MD Anderson Cancer center, where massage has been provided to patients since 1999, therapists have made some interesting observations of massage effects with thousands of patients. Sat Siri Sumler, a massage therapist with 13 years of experience at MD Anderson, notes that compromised health means inpatient massage sessions need to be shorter than the average outpatient session of 45-60 minutes. In its early years of the massage program, they began inpatient massage sessions lasting up to 45 minutes. Over time, however, Sat Siri and other MTs recognized that the potential for “overtreating” (or exceeding dose tolerance) is greater when a massage lasts 30 minutes or more, and especially as it heads toward 45 minutes. They observed that 20 minutes of massage seemed sufficient for relaxation, whereas just 10-15 minutes would meet with, “That’s all?” from the patient. For these reasons and others, they shortened the sessions. By shortening sessions, therapists could see more inpatients and still have an impact. Massage staff also provide on-site (“chair”) massage to patients and caregivers in waiting rooms for surgery, radiation therapy, ICU and Critical Care, inpatient units, and other areas of the hospital. Even though chair massages in many settings last 20 minutes, the hospital team found that 10-minute chair massages were sufficient. According to Sat Siri, they saw that people were relaxed and very grateful after 10 minutes. A 10 minute massage was often followed by many tears and appreciative hugs from patients and families. By keeping those sessions to 10 instead of 20 minutes, each therapist could see four people per hour, and help more people than a 20-minute standard would allow. Most of us would prefer longer massage, but in both these cases, keeping sessions short stretched the value of the program, optimizing use of the massage budget. Dose-finding studies for massage therapy are currently in progress. Go to www.clinicaltrials.gov, a database of government-funded trials, completed and in progress. There, do a search for “massage” and “dose.” There you’ll find a dose-finding study of massage for neck pain, headed by Karen Sherman of Group Health in Seattle. There’s more there, too. Try this “dosing” experiment: Check in with clinicaltrials.gov at the above link, or for published research, go to www.pubmed.gov, the US National Library of Medicine. Type in “massage therapy dose” (no quotes). There you’ll find a few completed massage dosing studies, as well as those in progress. Repeat this search 1x/month to see research emerging over time. It is guaranteed to be interesting. Who knows what we will discover about massage dosing? Sat Siri Sumler is featured in our Hospital-Based Massage Therapy webinar series, where she shares insights, advice, and even sample massage protocols from her years maintaining MD Anderson’s popular massage therapy program. 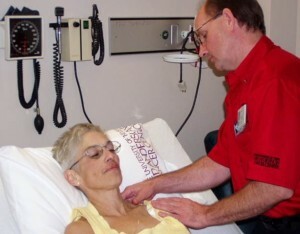 MD Anderson provides free massage to inpatients, families, and caregivers.